A common grumble around Hong Kong is that there’re no decent sandwiches to be found. An often-heard complaint is the price, even if nowadays the ingredients of this lunchtime staple are elaborate or the portions large enough to feed a village. New to the game comes Bread & Beast. Nestled down the Swatow Street cul-de-sac, the open front, semi-alfresco setting of Bread & Beast emits a relaxed, breezy ambience. 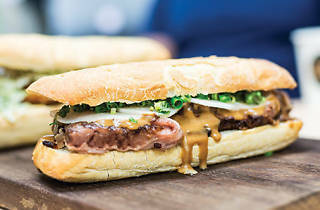 We sink our teeth into the Ngau Lam Wich ($78) which borrows its flavour profile from beef brisket noodles. The beef is slow-cooked for 12 hours and garnished with pickled daikon and chu hao (soy bean sauce) mayo. 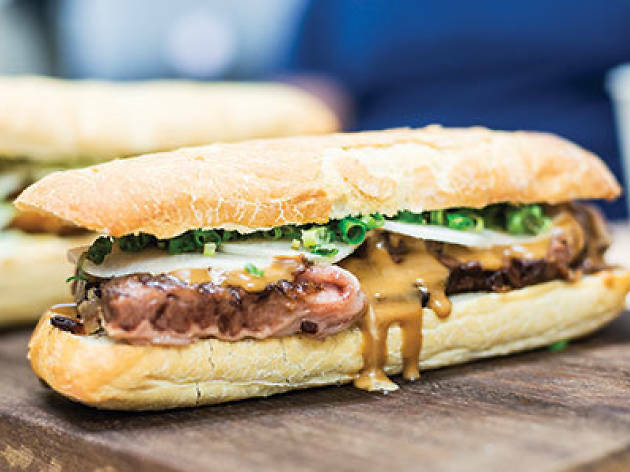 Served in a French baguette, the brisket is appropriately tender and soft to the bite, and in combination with the garnishes, it has all the aromas of a bowl of beef brisket – but more. The slight acidity of the pickled vegetable stimulates the salivatory glands and our appetites, to keep us chasing this sandwich bite after bite. We select the gazpacho ($40) and lotus root fries for sides ($30). Thinly sliced and deep-fried, the crispy lotus root chips are elevated by the fu yue (fermented bean curd) mayo. Balanced just right between the strong fu yue and hua diao yellow wine, the mayo has none of the signature bite of the ordinary condiment. Instead, it amplifies a floral aroma that mayonnaise is rarely associated with. After two such stellar items, the cold soup pales by comparison. It’s not bad, but lacks the breakthrough creativity available elsewhere on the menu. Bread & Beast pioneers a unique taste of Hong Kong. It offers neither the most expensive nor cheapest sarnies in town, but when compared to renowned sandwich choices in other major cities, the price actually rests comfortably in the median range. There you have it folks, your sandwich conundrum is solved.